Sony Users Now GO RETRO with NOVOFLEX! Allows users with Sony E-Mount cameras (e.g. Sony Alpha 7/Alpha 9 series, Alpha 6000 series, etc.) to reverse mount their existing lenses to achieve closer focus. The new NEX-RETRO reversing adapter from NOVOFLEX is a powerful addition to any Sony user's toolkit. Allows users with Sony E-Mount cameras (e.g. Sony Alpha 7/Alpha 9 series, Alpha 6000 series, etc.) to reverse mount their existing lenses to achieve closer focus. NEX-RETRO transfers all electronic functions such as aperture control, EXIF data and autofocus, from the reversed lens to the camera body as if it were mounted directly. With a 18-105 mm zoom lens in reverse position, you get an image ratio of 1:7 at 105 mm and 2.8:1 at 28 mm expanding the versatility of your zoom lens exponentially. The adapter itself has a 58mm filter thread. Stepping rings are available for other filter sizes. 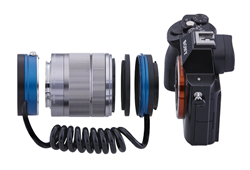 In addition to reversing the lens on the camera, NEX-RETRO allows the Sony E-Mount system user to incorporate NOVOFLEX bellows systems for even closer focus and greater magnification ratios. Bring to life the finest details: NEX-RETRO allows reverse mounting of Sony E-mount lenses for close focus macro applications. No compromise in flexibility: NEX-RETRO retains complete electronic functionality between Sony E-mount lenses and bodies. Precision engineering: NEX-RETRO is the perfect tool to make the perfect picture even better.